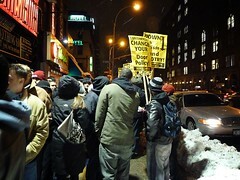 Vivienne Gucwa Protesters outside the Continental bar Saturday. The bar’s owner, Trigger Smith, said that he was willing to meet to discuss concerns about discrimination at the bar. The owner of the Continental Bar, which is being investigated by the City Human Rights Commission, told demonstrators who gathered outside the bar on Saturday night that he would meet with them to discuss their grievances. 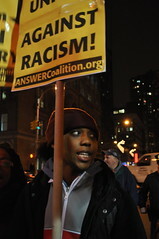 Since December, members of the ANSWER coalition have held protests outside the bar, saying that its bouncers have enforced a discriminatory policy that has barred some African-American patrons. In the past, the bar’s owner, Trigger Smith, has denied that the door policies were meant to keep out any particular group, but on Saturday, he emerged to say that he was willing to hold a dialogue. Some protesters welcomed the offer, but others said they would reserve judgment. Jeanette Caceres, a lead organizer with the ANSWER Coalition, said she was heartened that Mr. Smith was “at least showing in words that he wants to meet,” but said she has “yet to see” if he will follow through with his statement. She said that Mr. Smith offered to meet with protesters in his bar during the picket, but the group preferred to wait and meet in a more “neutral” location. Danny Shaw, a professor at the City University of New York said that he didn’t think it would be appropriate to meet inside the bar because its “ambiance is not conducive to a serious sit-down about issues so intense.” Mr. Shaw, who teaches a class on cultural diversity, brought his students, some of whom, he said, had discussed friends’ complaints of being denied entrance to the bar. Like Ms. Caceres, Mr. Shaw called Saturday’s picket “successful” but said he found Mr. Smith’s demeanor to be “mocking” and “sarcastic.” At one point in the evening, he said, Mr. Smith had joined in the chanting with the protesters. And, as he has in the past, Mr. Smith stated that his door policy is not motivated by prejudice. “I told them I supported Barack Obama,” he said adding that the bar’s dress code, which he said does not allow “baggy saggy jeans or bling” is not racist. “Some minorities wear them more than others,” he said. 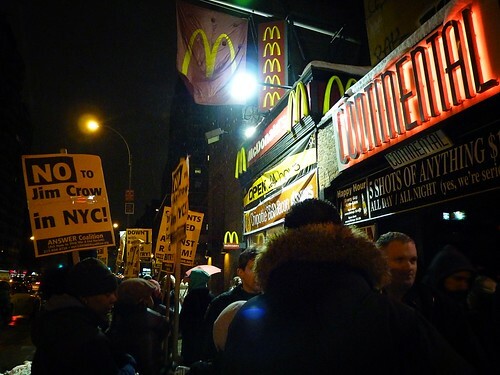 The picket, which ended at 9 p.m. – an hour earlier than scheduled because of the freezing weather, had “no effect” on business, Mr. Smith said, although one protester, Armide Pierre, said some potential customers “walked away” from the bar after she handed them flyers. After the rally, Mr. Smith reflected in the warmth of his bar, where customers drank and mingled. “I’ve been here 19 years,” Mr. Smith said as a customer stood at the bar and order one of the house specials – five shots of liquor for $10. Simon McCormack Investigators with the City Commission on Human Rights have begun looking into an allegation of bias at the Continental bar. The City Commission on Human Rights has begun investigating an allegation of racial discrimination against the owner of the Continental bar, who has been accused of denying admittance to African-American patrons. The commission, which is charged with examining civil rights complaints in the city, has been looking into an allegation of bias at the bar for the past month. A spokeswoman for the commission confirmed that an investigation is underway but, citing confidentiality concerns, declined to provide any additional details. The owner of the bar, Trigger Smith, said that he intended to cooperate fully with the commission’s investigation and denied that there was anything improper about the admittance policy at the Continental. “There’s not a prejudiced bone in my body,” Mr. Smith said in an interview with The Local earlier today. Mr. Smith acknowledged that the commission had conducted another investigation into allegations of bias at the bar several years ago. However, he said, that case was closed. Mr. Smith, who is white, said that his own review of the bar’s policies led him to believe that there were “a fair mix of colors” in the bar. Meredith Hoffman Shaniqua Pippen said that she was denied admittance to the Continental bar by a bouncer who said “Your kind don’t know how to act.” Ms. Pippen joined a demonstration tonight at the bar. Yelling “down with racism,” a group of 30 demonstrators gathered tonight outside the Continental Bar to protest what they said was a pattern of bias by the bar’s owners against African-American patrons. 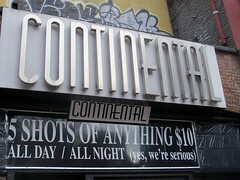 The owner of the Continental, Trigger Smith, denied that there was anything improper about the way that the bar screened its patrons. Mr. Smith, who is white, said that patrons were not being turned away because of the color of their skin but because the bar has a policy against admitting patrons who do not adhere to its unwritten dress code.